Iowa is prominently featured in the opening minutes of the new “Star Trek” movie that’s being released nationwide today. Our real-life space heroes are hopeful science fact can more closely follow the fictional exploits of the film’s hero, Jim Kirk. Astronaut and Burlington native Jim Kelly, who’s piloted two space shuttle missions, says he’s thrilled NASA is making significant progress with Project Orion as a replacement for the shuttle fleet. The space shuttle Columbia was the first to go into space in 1981. Project Orion is expected to become reality in about six years and may be landing Americans on the moon in 2020. Kelly says he doesn’t think he’d be a likely candidate for Orion but suggests fellow Iowan, veteran astronaut Peggy Whitson, might have a good shot at our nation’s next moon shot. 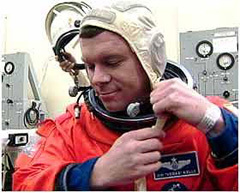 Whitson served two six-month missions aboard the space station in 2002 and from October of 2007 until April of 2008. Whitson, a Beaconsfield native, accumulated 377 days in space between the two missions, the most for any U.S. astronaut. The tiny eastern Iowa town of Riverside claims to be the future birthplace of Star Trek hero James Kirk. The new film in the long-running series opens in a future-Iowa as the wanna-be space traveler gets a glimpse of a starship being built in a mammoth factory surrounded by cornfields.